Sophia is Peter Bjärgö and his collaborators from the Swedish neoclassical band Arcana (and others). Formed in 1998, the project has been an outlet for Bjärgö to explore darker themes and more aggressive industrial sounds. 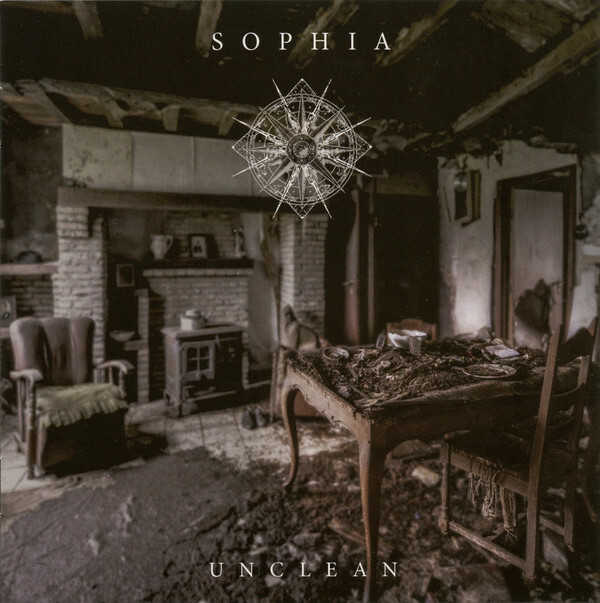 On this 2016 release from Cyclic Law, Sophia confronts “the folly of man’s self destructive tendencies” – how our worst selves reach their full expression when we withdraw from others. This isolation is depicted in the album’s cover images – empty rooms in a ruined house, strewn liquor bottles – while the album’s sounds attempt to reach inside these miserable spaces. We hear deadbolts unlocking, rusted hinges swiveling open, and grand choral sounds like light piercing stale darkness. Drums are struck – the rhythms are “martial,” but that word hardly captures the feeling – it is the sound of time advancing deathward. That urgency is echoed in the spoken word lyrics (included in the booklet), a plea to examine our selfish actions. The album’s final three tracks show what awaits us if we refuse: in “Where the Steel Meets the Flesh” (T11), we hear the faint beeps and buzzes of a hospital room, another miserable space, where we will (likely) face our final moments, alone.